The cover image on BPB14’s Programme Guide is by Agnieszka Rayss of the collective Sputnik Photos. 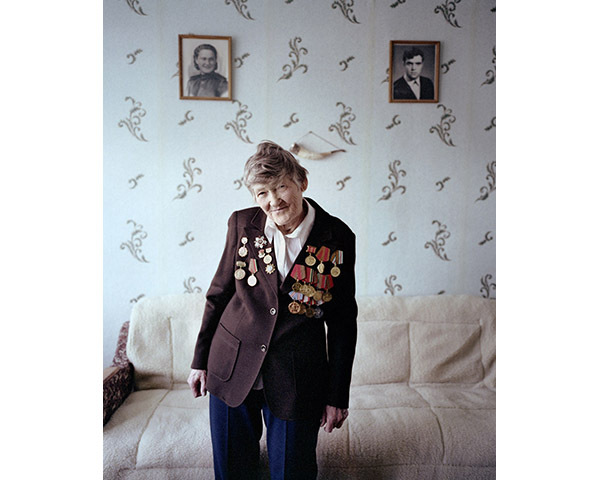 The portrait of Galina Ivanova Pagarelava is from the 2011 series I Reminisce and Cry for Life, a project about women veterans of World War Two in Belarus. “I got into the front-bound ambulance train. I was at the front, I collected the wounded and drove them to hospital. They were heavy, one had to carry them on one’s own back. When we took the wounded away we were often bombarded by the Germans. We had “death passports”, metal tags with our name and last name to identify us in case we were killed. This is how the four years of war went by. I was at the Leningrad front, the Baltic front and the Karelian front all the way beyond the Arctic Circle. It was daylight all the time at the Arctic front. We wrote letters on the train – at night.